Want some music to kick off the season? Why not download the O.I.L.D. soundtracks? They’re here, here, here, and here! So what better way to start OILD than with a game by our own wonderful commentator and player? That’s right, today’s ice level is Frosted Frosty Donut Party, from Donuts n’ Dragons! Yep, this year Phil learned how to program, at what I can only describe is “hyper-ultra-mega-light-speed”! I tossed a simple game design about a fat dragon bouncing around, and he loved it so much that he made the dang thing! 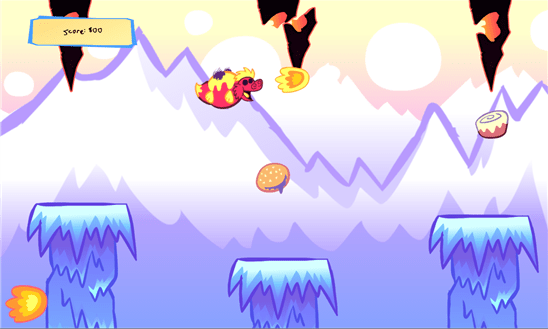 In Donuts n Dragons, you play as Fatty Dragon, a lovable little squishy beast that’s always on the hunt for more delicious pastries. But there’s an interesting secret about his delightful homeworld. Can you help Fatty uncover the truth and get some rad dessert in the process? You can actually buy the game on Google Play and iTunes right now! In this ice stage the platforms become very slippery, as is the custom. Fatty had a pretty easy time bouncing off of the trees in the previous jungle world, but now you have to worry about your timing. Hopefully the little creature doesn’t fall off! Everyone knows there aren’t any donuts on the GROUND! And no, I totally didn’t just shoehorn this stage in just to post about it for O.I.L.D.! Nope, never! Not me! How dare you accuse me of such things! Nope, not shoehorned AT ALL. So what’s next? Well, this is where I link to some awesome Ice Level songs! Tired of that same old holiday music? Never fear, for these songs will get you into the spirit of the season, without any cheesy lyrics or annoying chords!… well, okay, maybe SOME cheesy lyrics… but that’s later. 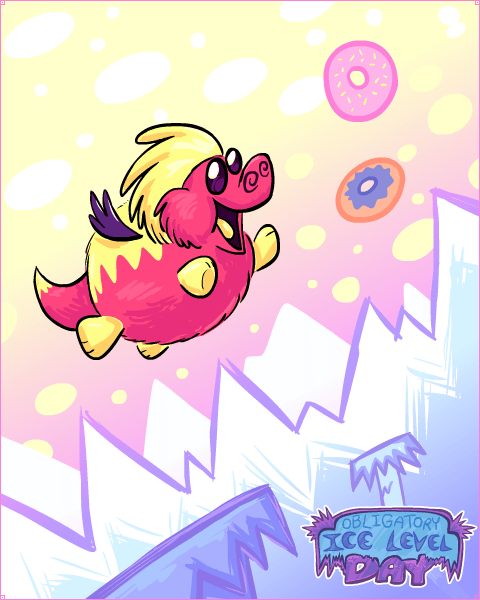 For now, you can listen to Snow What I Mean, the ice level theme from Donuts n Dragons! It was written by Cody, Phil’s buddy and game composer extraordinaire! Since today’s game is a (VERY) small indie game, let’s listen to some fun ice music from other indie games too! Here’s Winterbliss from Castle Crashers! I actually heard that song before I even played the game, and I liked it back then too! And this is Beloved Tomboyish Daughter, which is the ice fairy Cirno’s theme from Touhou: Embodiment of Scarlet Devil! And now, time for some remixes! This Winterbliss remix from FamilyJules7x really rocks! And this remix of Beloved Tomboyish Daughter has a really great, fun beat to it! Give them a listen! What will tomorrow’s ice level be? You’ll just have to wait to find out!